Free Shipping Included! 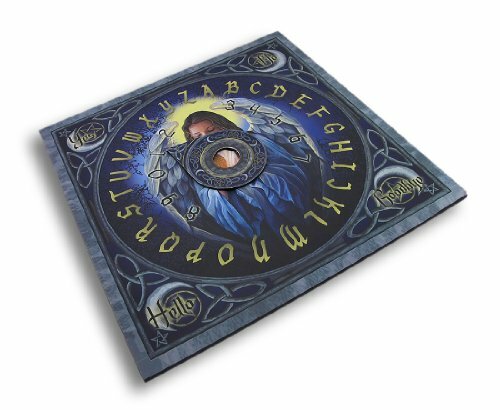 Fantasy Gifts Lisa Parker Angel Spirit Ouija Talking Board with Planchette Paranormal New by Fantasy Gifts at UtopyaCon. MPN: 2408A. Hurry! Limited time offer. Offer valid only while supplies last. Angel Spirit Ouija Board with Planchette. Designed by Lisa Parker. Made from medium density fiberwood. Approximately 14.5 inches long (37cm). Angel Spirit Ouija Board with Planchette. Designed by Lisa Parker. Made from medium density fiberwood. Approximately 14.5 inches long (37cm). Includes original manufacturers box and packaging. The Ouija board, also known as a spirit board or talking board, is a flat board marked with the letters of the alphabet, the numbers 0-9, the words yes, no, hello, and goodbye, along with various symbols and graphics. It uses a planchette as a movable indicator to indicate the spirit's message by spelling it out on the board during a séance.